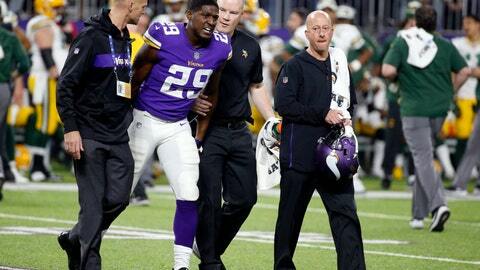 EAGAN, Minn. (AP) — Xavier Rhodes was trailing Green Bay’s Davante Adams in coverage along the sideline late in the fourth quarter last week. Aaron Rodgers let the ball fly and Minnesota’s best cornerback raced to catch up. Rhodes arrived in time to make the tackle after a 36-yard gain by the Packers, but in the process of the acceleration he hurt his hamstring. As soon as he stood up, he grabbed his right leg and fell back to the turf. The immediate fear was a multiple-week absence for one of the most valuable players the Vikings have. But after testing and treatment, the diagnosis was a “very, very mild” injury, according to coach Mike Zimmer. He said on Wednesday, before Rhodes was held out of practice, that “there’s a good chance” the 2017 All-Pro pick will be able to play on Sunday at New England. With Tom Brady and that potent Patriots offense up next, the timing could not be better for Rhodes to heal quickly. With first-round draft pick Mike Hughes out for the season because of a torn ACL in his left knee, the depth behind Rhodes and Trae Waynes has thinned. Mackensie Alexander is manning the slot on most of the nickel plays, and rookie Holton Hill has been sent in several times to play on the outside as a fill-in when someone’s hurt. The latest opportunity came against the Packers, with the Vikings leading 24-14 when that reception by Adams set up the visiting team for a field goal. Rhodes and Waynes have each missed one full game, and they’ve also both been forced out of several contests because of injuries. The undrafted Hill was a priority free agent out of Texas for the Vikings right after the draft. Grasping Zimmer’s system took some time in training camp and beyond, but he has come a long way and been asked to play more meaningful snaps than anyone would have anticipated. “Now they give us a call, and I just line up, and it’s like natural,” Hill said. Though no soft-tissue injuries are the same, the Vikings have been especially conservative about handling them lately. Running back Dalvin Cook missed five games with hamstring trouble, and linebacker Anthony Barr was sidelined for three games with the same injury. So it stands to reason Rhodes won’t necessarily be cleared for action against Brady, who with two touchdown passes would move ahead of Peyton Manning, who had 579, for first place on the NFL’s all-time list, including playoffs. Regardless of how Rhodes fares over the rest of the week, Hill will need to be ready.